Well, this has certainly extended the smile on the boy's face as the LEGO Imagination Factory are heading down to Lulworth to make Camp Bestival even more perfect for us! This week some truly fantastic sounding Oddities & Discoveries were announced. An incredible ape-powered pop-up circus providing wondrous entertainment for your delectation and appreciation. Witness magic, contortion, hula hoop, mime, an amazing array of circus skills and more from this cabaret of curiosity, popping up in all four corners of Camp Bestival! A celebration of ‘free build’, this magical environment will immerse you in the LEGO belief in the power of each individual’s imagination. Doubters might see a pile of bricks and accessories but ‘we’ see a jet fighter, a beautiful flower, an alien monster, our dog called Spike or the skyline of New York. The golden rule of The Imagination Factory is that there are no rules – no rights or wrongs – just inspiration to let LEGO enable you to build anything that your imagination can conjure up. A ramshackle but beautiful edifice with a stargazer's viewing platform, there will be camp-bestiscopes for studying the curiosities happening across the festival and searching for the stars. Hidden in the heart of Oberon's Observatory is an old projection room where Camp Bestival will screen 21st century windows into other worlds, space and art. 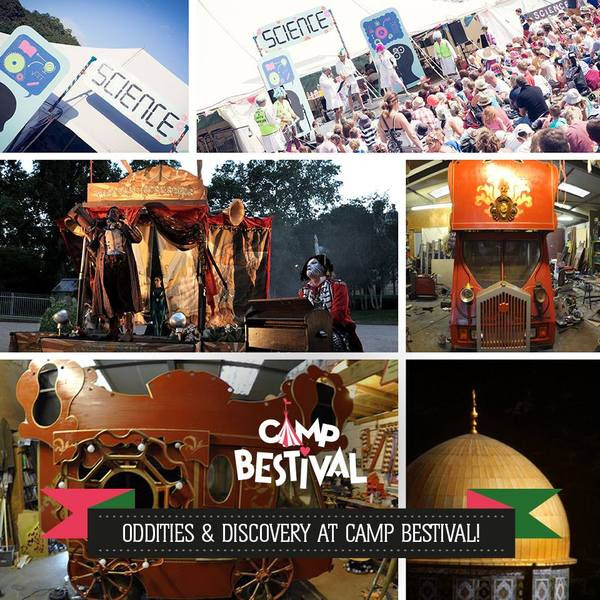 For the period of one lunation only, Camp Bestival invites you to come and explore this extraordinary building. A mixture of traditional fairground showman heritage, pyrotechnics, a full independently powered 4K sound system and a bowtop caravan themed stage, that will play host to the devilish Mosschops and Sidewicket’s Britain’s Not Got Talent. So, do you want to perform on the craziest stage of all time? Have you got a talent? Have you not got talent? We don't care, because we haven't; so anything goes! From Dutch didgeridoo dancing to skateboarding budgerigars; panpipe duets to five-year-old Frank Carson impersonators (keep it clean please), we need you! Terms and Conditions do not apply. Certainly not for boffins only and is definitely not to be missed! It’s a glorious mix of science-based performances like now>press>play and Rock Guitar in 11 Dimensions, timetabled science including programming robots, 3D printing your favourite Minecraft designs, being amazed by a Rapsberry Pi and lots, lots more and drop in sessions where you can make video games with Play-doh, power an alarm clock with fruit, pre-programme a robot arm and so much more. There’s tons to stimulate and fascinate every age group! And that includes you mums and dads! And remember with our gargantuan music line up featuring De La Soul, Basement Jaxx, James, Johnny Marr, Sinead O’Connor and more, plus more kids entertainment than you can shake a stick at including Mr Tumble, Horrible Histories, Ben & Holly Live and loads more, plus brand new arenas, Project Wild Thing, comedy, theatre, attractions and activities, it really is the Greatest Family Show on Earth, so don’t miss out! All your circus dreams come true - website, Facebook, Twitter. All Tickets: - will incur a booking fee. - are non-transferable and cannot be re-sold. Check out my experiences here. Disclaimer: I am receiving family Camp Bestival 2014 tickets in return for previews and reviews of this year's festival. As always, views and opinions are my own. this certain info for a very lengtҺy time. Thаnk you and good luck.